This blog is now an archive of the activity of Playwrights’ Commons. Thank you for stopping by. 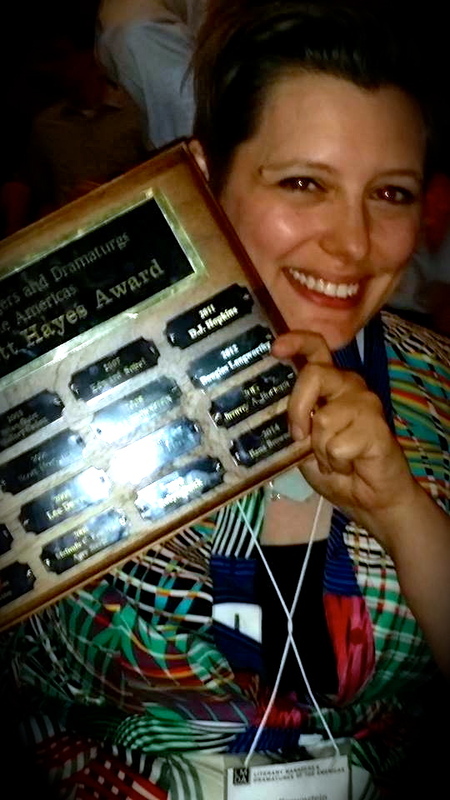 This past weekend, as Playwrights’ Commons Founding Dramaturg, I was honored to receive the 2014 Elliott Hayes Award — an international prize of Literary Managers & Dramaturgs of the Americas, given annually for demonstrated dramaturgical excellence. It was incredible to celebrate this event here in Boston, where LMDA was having its summer conference. At the request of many, I’m posting here my acceptance speech and call to arms for dramaturgs as leaders and public advocates. Inclusion. Intersectionality. Empathy. Advocacy. Action. I’ve been a member of LMDA for 15 years, and I can say without a doubt that nearly every radical idea and new direction I’ve tried in my artistic life has been sparked by ideas born from conferences and conversations with the people in this room. And 15 rooms past. The last time I stood up here in this capacity was in 2008, and I mentioned that I was hoping to launch a grassroots playwright development organization in Boston. I remember thinking: Jesus Brownstein, you said it out loud so now you have to do it. Three years after that moment, and after a test run at Liz Engleman’s Tofte Lake Center, I formally inaugurated the signature program of Playwrights’ Commons: the Freedom Art Retreat. But what is Playwrights’ Commons? It’s not incorporated. It has no board. It barely has a staff (really it’s me, and while she lived in Boston, Corianna Moffatt). The idea is this: a dramaturg has the power to be a curator, a facilitator, a teacher, an organizer, a distributor of resources both esoteric and logistical, a node around which a movement can happen, a driver of new forms, and a force for public good. The Freedom Art Retreat was born in one of the darkest times of my life from my desire, well, my need (hi Liz), to be in the woods, on a lake, for my own mental health. I thought, well, if I’m going anyway, maybe I can rent a bigger house and let some artists tag along. Then I thought, well, if they’re coming anyway, maybe I can organize some programming. And if I’m going to program it anyway, I should probably make sure we all eat really well. (This is one of the many places where Mara Isaacs and I are totally sympatico – break bread with someone to cultivate trust and humanity.) It seemed worth it. As Cyndi SoRelle said yesterday, I’m more of a do-er than a thinker, so I booked a house, and put a call out for participants. Six years later, I can point to the 26 early career playwrights, dramaturgs, and designers who have come to the woods for a week of collective creation and experimentation, building aesthetic and collaborative vocabularies that carry them back into the Boston theatre ecology. I can point to over 30 projects (and 1 entirely new company) that were made by Retreat participants across all three alumni years, in Boston, with one another. And I can point to the 375 members of the Boston & New England playwrights network, which I run on Facebook as a space dedicated to de-silo-ing playwrights, and cultivating energy as a sector. I do it for about $2000 a year. And frankly, so could you. So please, steal this idea. Adapt it to your needs. Step up and opt in: what does your community need most? In Boston, most professional theatre artists teach in our training programs, but we have enormous creative brain drain as recent grads look elsewhere for their artistic communities. Freedom Art was designed to address this heat-loss, and give early career folks shared collaborative experiences. That might not be a problem where you live, but surely there’s some tangible challenge in your city that could use your dramaturgical intervention. My soapbox tonight is this: you can make a change. As I was getting Playwrights’ Commons off the ground, learning to tweet, and teaching my amazing students at BU, I had the incredible good luck to find a home with Company One Theatre and its incredible staff collective. For the first time in my life, I felt like all my artistic and professional endeavors were aligning with my own social mission: to make work that makes a difference. The founders of Company One, two of whom are here tonight, all came out of Clark University, the motto of which is “Challenge Convention, Change our World.” This notion infuses all we do. There is a presumption that as a non-profit theatre, we have a duty to represent our city in the widest sense possible, to be answerable to the people, and to provide civic benefit. Our stated core values are: Never be satisfied; Diverse, socially conscious thinking; Innovation and creative problem solving; Artistic Excellence; and Development of the individual as part of the greater community. In the 3 years I’ve been on staff, my dramaturgy has been radicalized, thanks to the guiding philosophy of the company. Though I still relish the act of new play development, of being in the rehearsal room, it’s only one part of how I conceive of my practice. My colleague, managing director, and friend, Sarah Shampnois, never wanted to make theatre. She started as a community organizer. Her values and practice — and those of the other Company One founders — have been a model for me. Boston has just seen the election and inauguration of the first new mayor in 20 years. Massachusetts is about to go through a Governor’s race. The statehouse has been a battleground for budget fights, especially around the arts. And for the first time since I moved here, there’s a rising energy across our entire arts & culture sector that (a) there’s work to be done, and (b) we could actually do it together. As a dramaturg, I realized I was in a perfect position to join that movement and make a difference. And so could you. The only barriers to civic participation are apathy and inertia. Following Sarah’s lead, I’ve been able to testify at city council hearings and town hall meetings, meet with state legislators, intersect with MassCreative and the Massachusetts Cultural Council. Democracy is amazing when you opt in. And as dramaturgs, we have the exact skills for this task. I often tell my students that the dramaturg is the person in a process whose job it is to identify and open up pathways into the world of the play – or, if you prefer, into the big idea, the question, the issue – to open those pathways to every individual constituency and stakeholder. It’s context, it’s framing, it’s speaking the language of the person you’re trying to reach. But now I’m not just doing it for plays, I’m doing it for the health of the sector, for the future of emerging artists, and for the quality of life for all residents of this city in which I make my life and my art. I think about Hrotswitha a lot. Did you know she named herself? Her name means “the strong voice of Gandersheim.” It was a radical act that was meant to convey that she “stood firmly within the community of which she was a part” (citation). The community of people who allow me to do my best work is extraordinarily large, and if I named them all we’d be here all night. But I want to call out a few specific people. I feel sometimes that Shawn LaCount, Sarah Shampnois, Summer Williams, and Mark VanDerzee saved my life when they welcomed me into the heart of Company One. I am exceptionally, eternally grateful for their friendship. Corianna Moffatt made Freedom Art with me, and any of its success belongs at least 50% to her. Jim Petosa, my colleagues, and my students at BU not only allow me to cultivate my art and advocacy outside the university setting, they celebrate the ways it makes my teaching better. The staff of Company One is like a family to me, especially the dramaturgs who have been on my team, most recently Jessie Baxter, Ramona Ostrowski, and Ciera Sade Wade. Julie Hennrikus, Executive Director of StageSource, is a frequent co-conspirator and between the two of us I am sure we’ve made a pot of trouble. Speaking of trouble, I deeply appreciate the cadre of amazing women who are like my professional braintrust – you know who you are. And of course my husband Chandran, who not only tolerates but encourages all the barnstorming I’ve ever endeavored to do. I’ll close here: the common thread that runs through all of this work is a soul-deep dedication to the dramaturg as an artist of impact. If we are to accept that dramaturgy, in its efforts to contextualize and present traversable pathways, has merit as a creative act, then I believe social justice, mentorship, and advocacy have to be at the core of all I do. The thing that sustains me is that theatre is not just an art form, it’s a vehicle for empathy and humane connection. It comes to us through a history of ritual and spiritual practice, and though we’ve largely moved on from those structures, the roots remain. The human condition is one that seeks connection—something we’re sorely in need of these days. If any communal activity holds the promise of bridging the gaps, it’s the theatre. And so: I advocate, I mentor, I seek to make my small corner of the world better for us having been here. So can you. Meron Langsner: Three playwriting things: Over Here will be in the NY Fringe Festival, The Devil’s Own Game will have a workshop reading with Turn To Flesh Productions in NYC, and Legacies is being developed through One Bird Productions. (As an aside, fellow Retreatant Angel Veza is likely to be involved in Legacies). I also recently had my play, Bystander 9/11 included in a major documentary theatre anthology published by Bloomsbury. Lia Romeo: My play Reality won the HotCity Theatre New Play Contest last summer, and I am looking forward to the world premiere in St Louis this fall! Nina Louise Morrison: I’m a new member of Project: Project and Accomplice Writers Group, and I was a 2014 O’Neill National Playwrights Conference Semi-Finalist. I’ll be writing for The Mad Dash on July 12th. 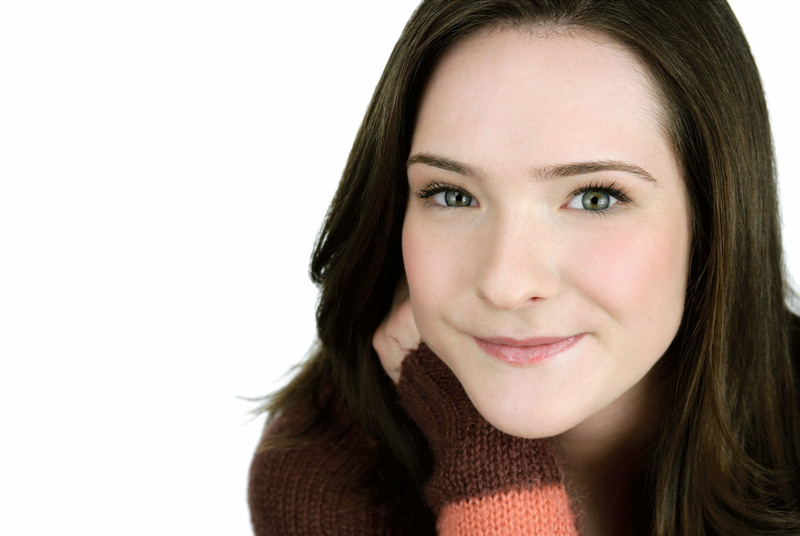 Emily Kaye Lazzaro: I had a small role in Olive Kitteridge, which will air on HBO some time this year. Also I’m in Boston Public Works and we will be producing my new play Three next spring. Just finished the first draft and it’s coming together really nicely! Corianna Moffatt: I devised and completed an oral history project, called The Impossible Questions Tour, spanning eleven states and gathered over 50 interviews about people’s personal philosophies on life, love, and loss. Phil Berman: I’m running a Kickstarter to record my first album!! The album features songwriting from the last five years, many of them performed/tinkered at Freedom Art, fully orchestrated by Somerville guitarist/producer Brendan Burns. Steve Bogart: Devised two theater pieces, Interference, and Lunar labyrinth with Retreat alums John King, Phil Berman, April Ranger, and Corianna Moffatt, that performed at the Oberon. Amanda Coffin: This past year I served as the Artistic Intern at Round House Theatre in Bethesda, MD, did some great new-play dramaturgy/directing work with the DC based company Field Trip Theatre, and served as Dramaturg for the Plimoth Players, the Shakespeare Theatre Troupe at Plimoth Plantation in Plymouth, MA. In the fall I’ll be attending Villanova University to receive my MA in Theatre. Jason Weber: I recently completed phase one of an ongoing practice-based research project in collaboration with a post-doc researcher at Yale (Mary Isbell) where we worked with students to explore the theatre rehearsal process aboard 19th century warships. We performed phase one aboard U.S.S. Constitution for an audience of museum staff and historians and are currently looking at phase two which will involve an expanded script for a public metatheatrical presentation. Allie Herryman: I’m the managing director at Open Hand Theater. That’s amazing enough considering where I was at retreat. Colleen Hughes: My play Directive 47 will have a staged reading as part of Fresh Ink Theatre’s Ink Spots reading series this fall. Barbara Whitney: Just finished up my first year as chair of the theatre dept at cambridge school of weston! Maybe now I’ll get to some of them other projects. Peter Staley: Just wrapped up my role as Producer and Actor in the world premiere of The Brink of Us, by Delaney Britt Brewer, in Brooklyn this past spring, supported in part by the fantastic New Georges, an Off Off Broadway company specializing in new works by female playwrights with female directors. April Ranger: Just had two poems published in a rad anthology called Courage: Daring Poems For Gutsy Girls, and I am currently booking myself a Northwest Poetry Tour for the fall! Lenelle Moïse: As some of you already know, my book, Haiti Glass, is here. I’ve been touring the U.S. and Canada sharing selections, live. Enjoy the book trailer! Basil Considine: My comic opera The Frat Party is appearing in the 2014 Minnesota Fringe Festival, mixing a team of Boston-area opera professionals with local talent. Amy Brooks: In July, I will return to West Virginia to serve as the Humanities Director for the Contemporary American Theater Festival. Rosa Nagle: I’m self-producing my play October in October, 2015, at the Broadmoor Sanctuary in Natick, MA, with help from the Massachusetts Audubon Society. Keith Trickett: I am once again acting this summer as Lancaster in Theatre@First’s production of Henry IV. Alison Ruth: This fall I’m moving to Iowa City to start an MFA in dramaturgy at the University of Iowa! Morgan Goldstein: I recently worked as the dramaturg for a year-long development project Sean Graney’s play All Our Tragic through the Radcliffe Institute, and as the dramaturg and line producer for a reading of Sextet by Tommy Smith. On Feb 17, 2014, Peter Marks of The Washington Post hosted an event called The Summit — it was a public conversation with several of D.C.’s leading artistic directors. As Peter noted in an article for The Washington Post, “Several months ago, Molly Smith, artistic director of Arena Stage, approached me with an intriguing offer: organizing and moderating a series of discussions, with theater people and topics of my choosing, onstage before an audience at her theater.” It was the first of three planned public fora — the others are scheduled for March 24 (focusing on actors), and April 28 (playwrights and directors). The event with Artistic Directors was not livestreamed, but it was live-tweeted by several attendees, chief among them Elissa Goetschius, artistic director of Baltimore’s Strand Theater. It’s probably fair to say that no one involved expected the event to blow up twitter as it did that evening, nor to spark a renewal of the national conversation on gender parity and representation on American stages. In an effort to capture the vast amount of conversation that evening on twitter, and to bank Elissa’s excellent live-tweet reportage, I created a Storify (a kind of twitter narrative) of the tweets using the hashtag #TheSummit, which you can find HERE. There was a tidal wave of response to #TheSummit, and I’m using this space to attempt to catalogue it for future reference. If I’ve missed an article of note, please let me know in the comments section. • WE EXIST, an open-source list of female playwrights, initiated as a response comments at The Summit that women playwrights weren’t “in the pipeline” that runs to major stages for production. • It was already in the works when The Summit happened, but Boston playwright Patrick Gabridge’s count of the Boston area theatre season (looking at gender and ethnic diversity for playwrights and directors) was well timed for this conversation. It’s in three parts: Part 1 (large and mid-sized theatres) — Part 2 (small/fringe scene & overall numbers) — Part 3 (New England theatre). UPDATE 3/17/14: Here are some additional, pertinent articles. Thanks to everyone for the links. • Some context for Pat Gabridge’s Boston count (linked above) — here’s a count I did for Boston’s 2012-13 Season. • Mike Lew was prompted by #TheSummit to address how “Arts Education Won’t Save Us From Boring Inaccessible Theatre.” And in case you missed it at the time, Mike also wrote wisely on gender parity in the theatre, back in June, 2013. • Playwright Gwydion Suilebhan asks what we might mean when we say “gender parity.” And, here’s his count of DC theatre seasons regarding racial and gender diversity. • BOSTON THEATRE TOWN HALL MEETING ON DEFINING GENDER PARITY: SATURDAY APRIL 27, 11A, AT BOSTON PLAYWRIGHTS’ THEATRE. Rsvp at the link. Amy Brooks is a dramaturg, actor, journalist, and teacher from the wild and wonderful state of West Virginia. She received a BFA in Acting from West Virginia University and is currently an MFA Dramaturgy teaching assistant at the University of Massachusetts Amherst, where she is a co-founder and Graduate Producer of the UMass New Play Lab. Her devised theater credits at UMass include a collaborative collage of autobiographical poems entitled Seven, and No Filter/With or Without You, a dance/monologue/spoken word examination of social media’s impact on undergraduate identity. Prior to her journey East, Amy lived and worked as a writer, production dramaturg, and actor in Dayton, Ohio. She was a core company member of the SEED Theatre Project, where she co-directed and dramaturged Pamela Gien’s The Syringa Tree, as well as company dramaturg and performer with the Free Shakespeare! troupe. Amy’s theater criticism and arts features were published for two years in Impact Weekly (now the Dayton City Paper); she also read scripts for FutureFest, Dayton’s international new play festival, and served as a performance mentor for young actors at Town Hall Theatre and W. Shakespeare & Co.
Alison Ruth is proud to be a member of the Freedom Art family! Originally from Boston, she has been working as a dramaturg around Philadelphia for the past two years. She is currently the production dramaturg at Delaware Shakespeare Festival. 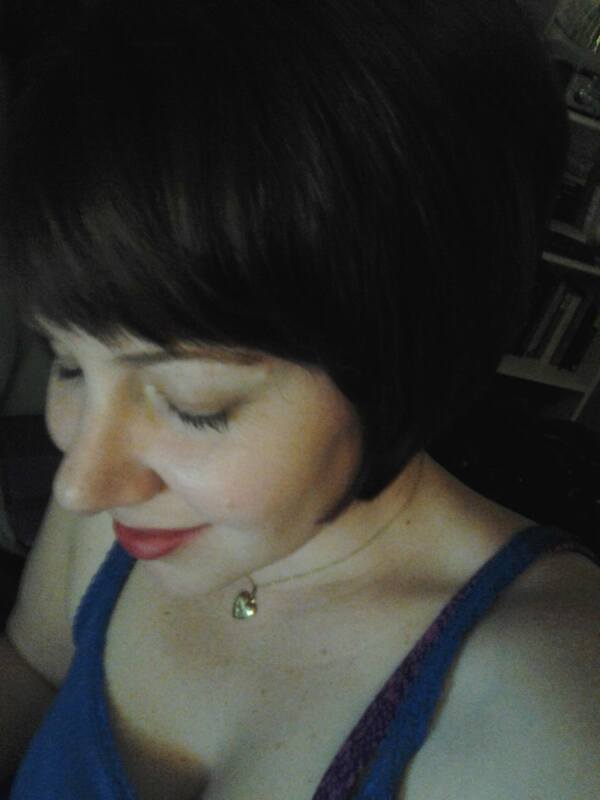 In the fall of 2014, she will be moving to Iowa City to start an MFA in dramaturgy at the University of Iowa. Rosa Nagle is a poet and a playwright. She graduated the University of Massachusetts at Boston with a BA in English. Her first book of poetry, “From Zephyr’s Ankles” was published in 2009. Her poems have appeared in “The Iconoclast,” “Crucible”, and “The Artistic Muse,” magazines. 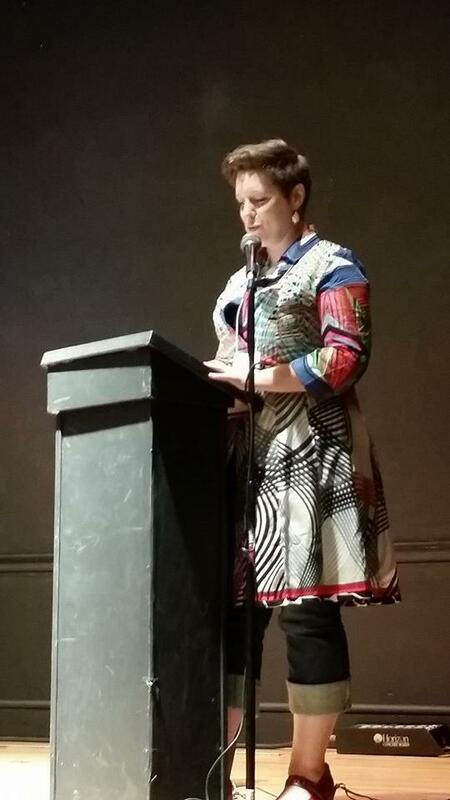 Five of her poems were included in the 2010 anthology of women’s poetry “Postcards From Eve.” She was the featured reader at Stone Soup poetry series in 2013. Her play “On The Death Of June” had a staged reading at the Performing Arts Center of Metrowest, and was also a finalist in the Two Paths Productions Summer Festival, 2014. Rosa is self-producing her play “October” in October, 2015, at the Broadmoor Sanctuary in Natick, MA, with help from the Massachusetts Audubon Society. She continues to participate in workshops at Grubb Street.